The Funky Felter: Everyone needs a little heART! 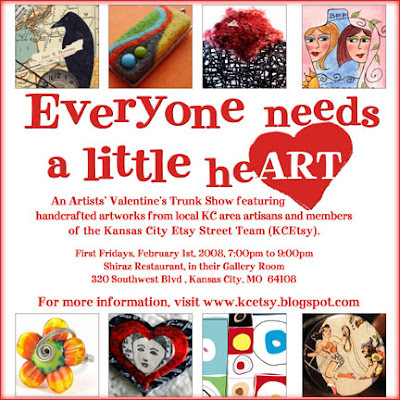 Kansas City Etsy Valentines Trunk Show, Friday February 1st! Everyone needs a little heART! Kansas City Etsy Valentines Trunk Show, Friday February 1st! I'll be a vendor at this upcoming Kansas City area trunk show. It is held this Friday at Shiraz Restaurant from 7 - 9 p.m. There will be several other Etsy sellers participating from our local KCEtsy street team. Please come by, browse, and shop local for your loved ones this Valentine's Day. You can read more about the event on our KCEtsy blog.